P2P loan marketplace sites Prosper and Zopa may not even realize the tremendous extensibility of the platforms they are creating. Prosper has created a group lending structure as microcredit and affinity models have shown that repayment ratios should be higher for group members than standalone individuals due to the community shame factor, incentives and (in the Grameen Bank model) cross co-signing of the loans. Two months after the site's public launch, Prosper members have started over 1200 affinity groups, in a full breadth of areas ranging from entrepreneurs to libertarians to military and religious groups to LGBTs to college alumni to gardeners, essentially in any personal, professional, educational, religious, hobby, etc. affiliation that a person may have. These Virtual Affinity Groups will start to amass tremendous economic power, bringing hundreds of individuals together both on an ongoing basis and as virtual "flash mobs" for the purpose of participating in specific transactions or other activities. Virtual Affinity Groups may get their start in the lending context but can quickly expand to include all community financial transactions: GroupCredit, GroupInvesting (real estate, etc. 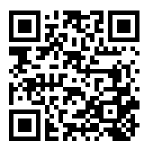 ), GroupPurchasing, GroupJobs/GroupProjects and GroupPhilanthropy/GroupSocial Entrepreneuring. Financial transactions no longer need to be unitary, all major financial transactions can take place in groups, with radically different business models, on an unprecedented scale and with tremendous savings and efficiency, for example, GroupPurchasing can include vendors bidding to groups of thousands of buyers assembled to purchase certain items and services. Beyond the economic sphere, Virtual Affinity Groups can also wield substantial political and social power, for example with purpose-based assembly and disassembly of affinity PACs, and regular voting on general issues, say each registered voter has a high-level ballot of daily or weekly state and federal legislature issues on which to have general input. The ability to collect thousands of individuals around a temporary or ongoing purpose on the Internet is possibly the most important and interesting functionality of what is being created by P2P lending marketplace platforms. In "On Intelligence," Jeff Hawkins' focus on Machine Intelligence, a near-term, human-controlled tool as compared with Artificial Intelligence, a longer-term self-evolving entity that could dominate humanity is a nicely-defined accessible area of the near future. His framing of the Intelligent Machine as a tool for extending human capability liberates the stalled Artificial Intelligence focus on the humanoid, Turing Test-passing form of created intelligence and frees the imagination to consider the possible uses of intelligent machines with non-human properties. Hawkins affirms the difficulty of envisioning the specific applications of radical new technologies and suggests the technique of identifying the properties and capabilities of future intelligent machines such as speed (electrical pulses traveling a million times faster than neuronal impulses), capacity, breadth, pattern-recognition and sensory systems comprised of all naturally existing systems (including radar, sonar, echolocation, electrical field sensing, etc.) plus new senses natural to the digital substrate, and then envisioning uses from these properties. -First considering mathematics, physics and biotechnology, intelligent machines can potentially think in more dimensions than three or four, providing tremendous value not only in solving problems but in merely representing string theory, protein-folding and cell process phenomena. -Second, considering scale, intelligent machines with orders of magnitude of greater depth and breadth of pattern-recognition could possibly model and predict weather, energy consumption, demographic shifts and animal migrations with the same facility that humans use to gauge the crowdedness of the road on the daily commute. In Hawkins' view, intelligent machines are not threats and not mini-humanoids but very nice tools for increasing human knowledge and capability, a view which can only be lauded. Machine intelligence to evolve non-human senses? Jeff Hawkins has a recipe for building intelligent machines in his 2005 book, "On Intelligence.” Step one is creating a set of senses that conduct pattern recognition over their environment. Hawkins notes that machines could have new senses, senses that do not just correspond to the five human senses. Certainly machines can be better at receiving sight and sound input (electromagnetic spectrum pulses and sound waves), discerning a wider range than humans have evolved to perceive unaided (e.g. ; radio waves, X-rays, infrared). Taste is not relevant. Smell is relevant, notably in the sensors applications of air composition detection for smoke, chemicals, etc. Initially, intelligent machines are most likely to be single-purpose and stationery (e.g. ; not robots), so human sensory input related to mobility would be unnecessary. Machines are already responsive to “touch,” though mouse, keyboard and other input means are a different experience than the human nervous system version of touch. What non-human senses would be useful and natural to a machine? Which patterns in what environments will machines be processing that would warrant additional senses? A machine sense, if parallel to a human sense, would consist of a specialized sensor bank for receiving a particular set of external patterns or type of information. From the machine eye view, the distinction between using a tool (e.g. ; an electron microscope over a network), having a perceptive capability and having a full-blown sense seems somewhat artificial (no pun intended). It is easier to identify some useful areas of perceptive capabilities for machines but now (the future could be different), these seem more like functionality extensions than full-blown new senses. Useful perceptive capabilities for machines are of two sorts: first, regarding the digital information world, for example measuring information density, information usefulness/relevancy (as Google purports), signal-to-noise ratio, time and entropy waves, etc. and second, regarding the physical world, for example measuring the basis for earthquakes and hurricanes, gravity, particle behavior and strong and weak electromagnetic forces, etc. Some of these additional perceptual capabilities for machines can just be created with software, and the ones that require specialized sets of sensors for information input are still more like tool than senses in the human connotation of the word. Especially with the distributed nature of digital information networks, a specialized sensor input seems like a peripheral not an integral part of machine intelligence. However, it is still early in the game and Jeff Hawkins may have something specific in mind when he refers to machines that could have new non-human senses. Federated identity (e.g. ; basically signing in just once on the Internet, not having to enter a user id and password for every site) is still stalled but maybe federated reputation networks could work. Most people would probably like to merge and leverage the reputations they have worked on earning for themselves in different virtual communities from eBay/Amazon/on-line selling to Second Life/World of Warcraft/online metaverse worlds and gaming to serving the community such as answering questions at AllExperts, etc. to professional ecosystem reputations and blogs. Right now, in each new web community, a reputation must be painstakingly built. If community members could bring their reputations with them, via some sort of validation mechanism, essentially a digital referral network, they could more quickly harness their capability and ramp up their participation in new communities. For example, the P2P digital lending space is just taking off and activity could be hastened if community members could bring rather than have to build their reputations. Cory Doctorow has a humorous and prescient look at this concept in his 2003 book "Down and Out in the Magic Kingdom" as people attempt to maximize whuffie (reputation) points rather than status/money as is the current societal norm. How liquid is the Prosper lending marketplace? About 2% of the currently listed 750 loans are fully funded and about 40% of the loans have more than one bid. This might sound low, but while the ratio of fully funded loans is generally unchanging at the moment, the number of loans receiving bids is substantially up, even in the last week. Understated interest rates are the primary culprit causing the vast majority of the nearly 5,000 loan listings to date to come and go with no bids despite multiple listing attempts. Diverse amounts for all credit tiers are receiving funding if the interest rate is right, although the fully funded loan of $5,000 is being received by AA-C credit tiers. 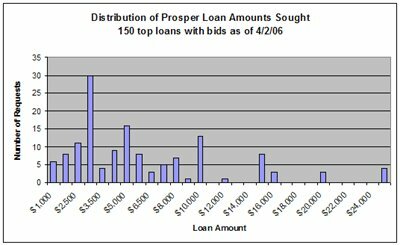 Below is an indication of the current loans that are receiving bids by size, $3,000 is the average loan size requested. Approximately 60% of Prosper's borrowers are in the HR (high risk) or NC (no credit) tier, for which the market interest rate Proper suggests is 24-31%. However, half of the 46 states in which Prosper is licensed have maximum allowed interest rates of 16% or less (including the large markets of NY, NJ, IL, PA and VA) suggesting that over 80% of borrowers (credit tiers D, E, HR and NC) in half of the company's markets cannot borrow. Even the highest rated borrowers, AA with zero existing debt, are suggested to request their loans at 7-9% which seems a bit steep. There are a few easy steps that could probably significantly improve the ratio of loans funded. First, better loan listings would help. Borrower listings are failing to interest the site's significant amount of deposited lender funds primarily because the requested rates are too low. The required rates may decrease over time as the reputation and repayments of borrowers are posted on the site but at the outset lenders are requiring a higher risk premium. Examples of successful listings, community mentoring and standard features like spellchecker and preview would hopefully increase borrower marketability. Making the lending process more like an actual market, specifically allowing full flexibility on the interest rate, would also improve liquidity. Lenders should be able to specify their rate for bidding on the listing, above or below the borrower's requested rate. Borrowers should be able to revise their listing to a higher interest rate in process or choose to accept a higher rate at which their loan could be fully funded. The site should eliminate trial and error and allow the market to decide the rate. The rates borrowers want to pay are too low for the current Prosper marketplace. Over time metrics may emerge that better reflect a borrower's repayment capability than credit ratings and DTI scores, reputation and repayment history as well as other ways an erstwhile borrower could signal to prospective lenders. Lenders could use these alternative metrics to have more comfort and trust in loan listings and bidding liquidity would improve. Life in other places in the universe may be farther or differently evolved such that we do not recognize it. Studying extremophiles on Earth suggests that this could be the most likely form of life uncovered on other planets and moons such as Jupiter's Europa and Callisto and Saturn's Enceladus. Extremophiles are organisms which thrive in extremely hot or cold temperatures such as deep sea vents and cracks 50-100 km below the Earth’s crust in the mantle. Extremophiles consume and metabolize gas expelled from deep within the Earth, suggesting that the sun or proximity to a sun is not an exclusive pre-condition for life. The total weight of extremophiles is thought to equal that of all of the species of animals living on the surface of the Earth. Whether archaea extremophiles can evolve into specialized multi-cellular organisms and evolve intelligence is a separate question and perhaps thought to be unlikely. Although some scientists like Thomas Gold in "The Deep Hot Biosphere: The Myth of Fossil Fuels" speculate that the origins of life may be via extremophiles rather than from ponds or amino acid-laden meteorites.